The State of the World's Fungi 2018 report – the first of its kind – highlights the aspergillus tubingensis fungus, found in a Pakistani rubbish tip and first documented in 2017. It claims this substance can break down plastic in weeks rather than years. Researchers say it could be used to deal with the global plastic-waste crisis, which has caused concern in the design industry and beyond. Aspergillus tubingensis can grow on the surface of plastics, where it secretes enzymes that break the chemical bonds between plastic molecules. "This ability thus has potential to be developed into one of the tools desperately needed to address the growing environmental problem of plastic waste," reads the report. Report explores "huge potential for fungi"
The report was compiled by a team of researchers at the Royal Botanic Gardens Kew, which is one of the leading institutions for fungal research internationally. It provides an overview of current knowledge about mushrooms and other fungi, and charts their usefulness to both the natural and industrial worlds. The report documents the more than 2,000 new species of fungus discovered in 2017, explores the threats they face from a changing climate, and chronicles their potential uses. "The State of the World's Fungi report has been a fascinating look into the fungal kingdom, revealing how little we know and the huge potential for fungi in areas as diverse as biofuels, pharmaceuticals and novel materials," Kew Gardens senior researcher Tom Prescott told Dezeen. "Fungi are being considered as a potential sustainable source for building materials, with companies in the US researching the possibility of expanding this market." As well helping to accelerate the decomposition of plastic, the report shows that species of fungus can also be used to remove pollutants out of soil. 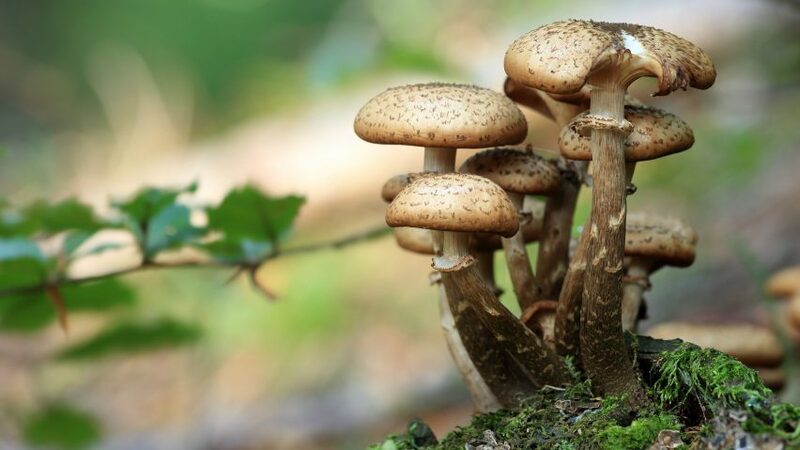 White rot fungi varieties pleurotus ostreatus and trametes versicolor can help remove pollutants such as pesticides, dyes and explosives from soil or wastewater, by degrading toxic polychlorinated biphenyl (PCB) chemicals. Trichoderma species, meanwhile, help with biofuels, by enabling the conversion of agricultural waste into sugars for ethanol. The report also confirms that potential for mushroom-mycelium-based products to be used as replacements for polystyrene foam, leather and building materials – a topic that is being explored by a number of designers and architects. In architecture, architect Dirk Hebel and engineer Philippe Block built their Mycotree to show how mycelium can used to create self-supporting structures, while The Living demonstrated the potential of mushroom bricks with its MoMA PS1 installation. And in design, Sebastian Cox and Ninela Ivanova have shown how mycelium can be used to make leather-like furniture. Kew Gardens – known for its expansive southwest London grounds and its recently renovated Victorian greenhouse – is home to a "fungarium" with some 1.25 million dried fungi specimens from all over the world. It also runs a "Lost and Found Fungi" citizen science project to helps raise awareness of some of the UK's rarest species of fungus. The organisation has launched a new website summarising the findings of The State of the World's Fungi report. More than 100 scientists from 18 countries collaborated with Kew Gardens scientists to assemble the "horizon-scanning" document.